Hunting is a pain. The best hunting is usually done in the early am - like 4 am wake up calls early am. A lot of times it's done in ugly weather- freezing cold, high winds, icy, etc. It's a lot of work - tons of gear, preparation, long drives, huge set ups and longer break downs. A dad of 10 would be given a pass for not wanting to take his kids out hunting, but our dad didn't take that pass. For him, hunting was a way for us to get out of the business of the world, and be together. I remember countless times of us trying to get out of hunting, "Come on Pop, it's too early" - "Pop, it's freezing outside" - "Pop we aren't going to get a thing" - we tried it all. But he would always make us go, because he knew it was worth it. As adults now, I am so happy he did. 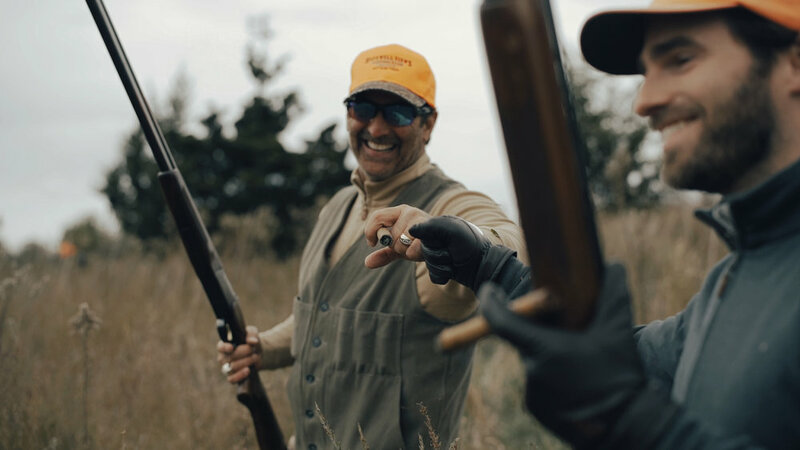 Some of our best memories of our lives happen before, during, and after a hunt. The camaraderie, the quiet, the chance to be outside, the cooking, the drinking, the laughing, the serious talks, the ah-ha! moments, the passing down of traditions - all of these things are because of or a part of hunting. As all of our lives have gotten busier, it's gotten tougher to break away from the noise and just be outside, together. But Pop won't hear the excuses, because he knows and has known all along - it's always worth it. It was pretty cool to be able to wear clothes we designed during a hunt we grew up doing. If you like the looks you can shop the Knit Workman Shirt Jacket that Lan wore, the Hoodie that Conrad wore, the Green Gables Quarterzip that I wore, or the Dune Quarterzip that my dad wore, and of course the Waxed Canvas Cap that Marco wore.